Dahlonega Trail Fest 2018 comes to America’s Best Unknown Town to promote and celebrate the Appalachian Trail and other nearby paths of joy and peace. They’re still looking for a few volunteers to work on Saturday, September 8, 2018. Those who offer their time will either receive free cosmetic surgery; all the brand-new gear you will need to hike the entire Appalachian Trail for free; $100,000 in college scholarship grants; or, a free meal from the grub tent. Hopeful hikers hit Dahlonega in February and March to begin their dream of thru-hiking from Springer Mountain all the way to Katahdin in Maine, where the AT culminates. In August and September, the most hearty hikers are near the 100-Mile-Wilderness. 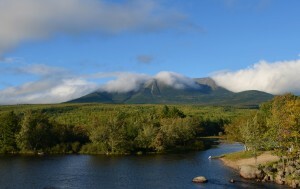 As they come out of the forest, Katahdin will be in sight. Think of the Dahlonega Trail Fest along the lines of “Christmas in July.” It’s not about folks on the Trail today. It’s for those who might hit the Trail someday. Or just stop by for the music, craft beer, hikers in tights, and vendors selling gear with creative names that writers like Hemingway, Dickens, Steinbeck and Orwell could never have conceived. If you’re in the market for a Marmot Tungsten or Big Agnes Copper Spur HV UL2 tent, you’ll be in dreamland. You’ll also find people who will bicker until they drop over the superiority of the Gossamer Gear Gorilla over the Arc’teryx Bora AR 63 — or vice-versa. Why? Hikers are passionate about where they hike, what they carry (and what they don’t lug around) and their gear. There will be oodles of hikers you can ask about bears, spooky things that blink in the night, and how far apart restrooms are on the Appalachian Trail. You either get it or you don’t. If you don’t get the sub-culture of hiking and camping, come to the Dahlonega Trail Fest. If you’re willing, you’ll be infected with the fever to go into the WOODS and … STAY there … all night long. Volunteer to help at Trail Fest and earn free meals and Trail Fest T-SHIRTS! Work a 4 hour shift and get a free meal at the Grub Tent worth around $8 AND a ticket for a free adult beverage at the Trail Fest Beverage Tent. Work 2 shifts and get a free Trail Fest quick dry T-shirt! At 2 PM on Saturday and Sunday, September 8th and 9th, Jennifer Pharr Davis will tell her tales of hiking more than 14,000 miles on six continents. Before Chuck Norris hikes, he calls Jennifer for survival tips. Do you want your kids to meet a hiking hero? This is your chance. Jennifer is beyond amazing. Listen to the music and meet nice people who aren’t afraid of the dark. Yes, they’ll ask you to go along. Do it. Hardly anyone is eaten by bears.